This post includes tweets from 6am KST, May 9th to 5:59am KST, May 10th. Junsu’s at home and OMFG IS THAT XIAHKI I SEE??? (Du Jun, 4:03pm KST) @0101xiahtic Aha kekeke I’m in Ilsan too kekeke It’s too windy.. Hyung, let’s play during the week if you aren’t too busy!! … So….. can I come? :D I’ll join the non-drinking party~!! (Gun Young, 4:38pm KST) @0101xiahtic I.. want to live in your house..
An article regarding the Japanese company I’ll be working with has finally been published. I think there will be lot of people who worry and have unkind things to say about the decision. I had been talking to this agency even before the guys’ problem arose, and I finally made the decision to pursue the venture, seven months since the happening began, after thinking about it and discussing it with my family and those around me. We’ve settled it so that there is a minimum chance of the situation becoming a problem, so please don’t worry about it too much. I, too, thought long and hard before laying down this decision. Though you may say that it was the wrong decision to make, it has been made and I must take full responsibility of what is to come. I just hope you do not hurt my family. I will just work hard. I’m sorry and I thank you all. Celebrity soccer team “FC MEN” gathers attention with their superior looks and excellent soccer skills. The soccer match between FC MEN and Super Stars of the “2011 Star Peace Cup Celebrity Soccer Tournament” was held on the 15th at the Kyunggido Suwon World Cup Stadium. On the day’s game, numerous idol stars including JYJ’s Kim Junsu, Kim Hyunjoong, Lee Kikwang, and Yoon Doojoon participated, drawing many fans to the soccer field. Despite being their first time participating in the tournament, FC MEN which has JYJ’s Kim Junsu as its captain, won 1:0 against Super Stars led by Jung Junho, proving that they are a soccer team which not only looks great, but also has excellent soccer skills. This match, which gathered a lot of attention early on due to the handsome stars in FC MEN, provided great attraction with the participating members’ “self-shining” looks and great soccer skills. Thereupon, netizens are showing great interests in the FC MEN members who are both handsome and skilled. Celebrity soccer team FC MEN, which is gathering popularity with its excellent looks and soccer skills, includes JYJ’s Kim Junsu, Park Yuchun, Kim Jaejoong, singer and actor Kim Hyunjoong, B2st’s Yoon Doojoon and Lee Kikwang, 2AM’s Changmin, Shinhwa’s Lee Minwoo, actor Song Joongki, Kim Bum, Lim Juhwan, Park Gunhyung, Lee Wan, comedian Park Sungkwang, and Kim Junsu’s older brother Kim Junho. Soccer team FC MEN led by JYJ Kim Junsu is officially joining with Suwon Samsung team (leader Oh Geun-yeong). Through press release by Suwon team on the 11th morning, the members of FC MEN such as Kim Junsu, Kim Hyun-joong, Yoon Doojoon, Lee Gi-kwang, and others will be officially affiliated with Suwon team as dated April 15th at 19:30. 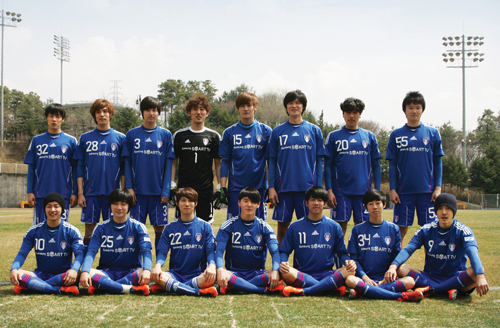 Reportedly this affiliated team will play together at Hyundai OilBank 2011 K-League round 5 at World Cup Stadium against Kangwon FC. Currently national keeper Jung Sung-ryong who belongs to Suwon team has been in charge as FC MEN’s honorary coach. In accordance to the affiliation, for FC MEN official activities in the future, they will use the name ‘Suwon Bluewings FC MEN’. The team will act as 5th team in Suwon’s group chart following the professional team – Maetango (U-18) – Maetanjung (U-15) – Littlewing (U-12). After debuting in a match against Kangnam FC, Suwon FC MEN will be up for an open-play match against Gyeongnam FC women soccer team on the 24th. Suwon FC MEN has commitment to give development for the growth of K-League and Suwon as well as giving social contribution to people. JYJ’s Junsu and his football club FC Men are set to join the Suwon Blue Wings, Samsung’s K-League football team, as the pro club’s fourth minor league team. “Before the K-League match between Suwon and Kangwon on Apr. 15th, we will hold an official ceremony to welcome FC Men, captained by JYJ’s Junsu, as a member of our club. From now on, FC Men will play in our team jersey as an official sub-group of our club,” an official from Suwon Blue Wings told local media today. FC Men first got in contact with the Blue Wings through Jung Sung Ryong, the goalie for South Korea’s national football (soccer) team. He became friends with Junsu and other FC Men players through a mutual friend, and was later named the honorary coach of the team. Jung and the players discussed ways to promote the city of Suwon and the sport of football (soccer) together, and came up with the idea of joining Suwon’s professional football (soccer) team. The Blue Wings currently sponsor three other minor league clubs including Me Tan High School (under 18 yr olds), Me Tan Middle School (under 15 yr olds), and the Little Wings (under 12 yr olds). A picture of JYJ’s Kim Junsu and singer and actor Kim Hyun Joong proving they are ‘soccer manias’ has been revealed. The man the netizens pointed out in the photo as Kim Hyun Joong is wearing a hat which makes it hard to see his face. But the man’s nose reminds us of the actor. The twins’ similar facial features and comical expressions set them apart from the rest in the team. The celebrity soccer team ‘MEN’ was created in April of 2010 with members including close friends such as Kim Bun, Song Joong Ki and Lim Joo Hwan. Kim Junsu was also made the invitational team captain of ‘MEN’. Celebrity male soccer team “MEN” reveals group photo! 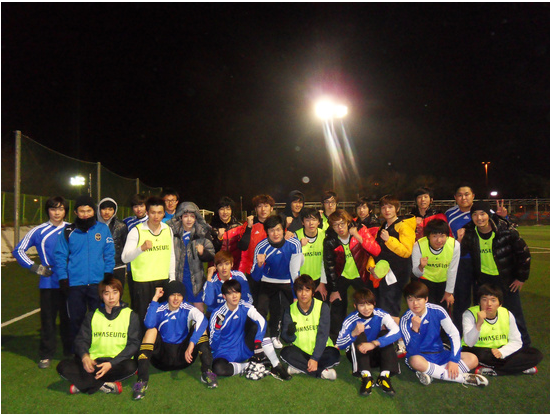 A picture of JYJ’s Junsu’s soccer team was recently revealed, and many other celebrities are on the roster with him! Junsu’s twin, Juno, recently tweeted a group picture of their soccer team, “MEN“, which consists of JYJ’s Junsu, Kim Jaejoong, Park Yoochun, SS501’s Kim Hyun Joong, Song Joong Ki, Kim Bum, and Im Joo Hwan (not everyone is in the photo). I guess they are not only gifted artists but athletes as well?